 Public Lab: Relevance of Virtual Reality to the World of Grassroots Mapping and Citizen Science? Relevance of Virtual Reality to the World of Grassroots Mapping and Citizen Science? I've been hearing about Virtual Reality since the "Lawnmower Man" days of the 1990s, and up until about a week ago my view of it as an expensive toy for rich people remained consistent. Then I belatedly discovered something introduced over a year ago by Google that, if I didnt know better, I could've easily been convinced came straight out of the PublicLab Store! Google Cardboard is such a simple approach to high-end technology that I actually thought it was an April Fools joke when first introduced (I.e Google Cardboard as competitor to Amazon Cardboard piling up in the recycling bin...). Cardboard VR was initially a simple stereoscope through which 3D imagery was produced by a smartphone. By making VR videos, games and map content available as smartphone apps however, the "Cardboard View" is being promoted as common as viewing a window in full screen. After having been sufficiently impressed by the experience myself, I started thinking about new ways such an interface could be put to use. This was especially true in early aerial photography where sophisticated Kite and Balloon Mapping rigs had to be capable of lifting heavy panoramic cameras. 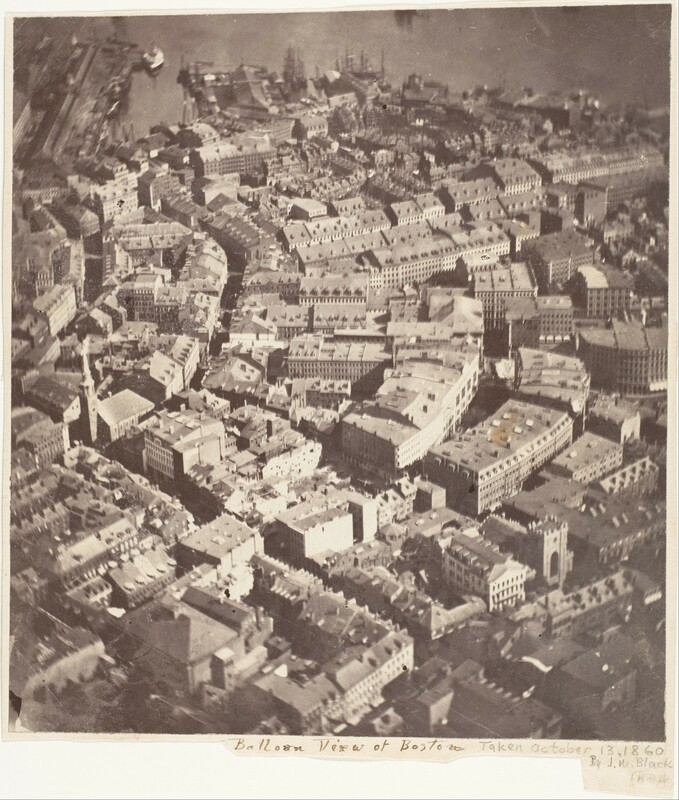 This 1860 photograph of downtown Boston, for example, is actually considered to be the first aerial photograph in history! The usage of stereoscopic photogrammetry to interpret aerial imagery was developed by the British in WW1 and was famously used in WW2 in Operation Crossbow resulting in literally millions of prints of which only a fraction have been digitized. 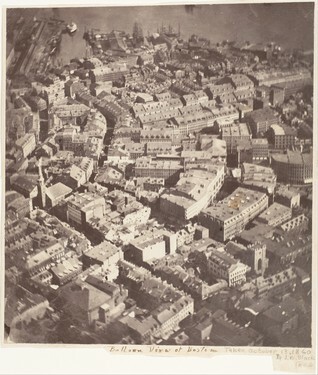 With aerial imagery becoming more and more accessible, contemporary usage of stereoscopy in the production of aerial images is becoming a frequent issue of discussion. The USGS for example provides stereo pair images by request. Discussions about stereoscopy and photogrammetry are certainly familiar in PublicLab circles and a Stereo Camera rig has undergone various iterations in the PublicLab community since first introduced 3 years ago. Meanwhile, Mapknitter and OpenDroneMap have been incorporating 3D elements into their respective platforms. Does the democratization of Virtual Reality interfaces have any potential application to the field of citizen science? Would widespread adoption have any affect on current grassroots mapping methods? Would further development of a stereo camera help produce 3D mapping imagery? What new insights could be gained by viewing current aerial imagery in 3D? Please do feel free to reply in the comments thread or via discussion forum. The NYPL has a great tool called Stereogranimator which allows users to create 3D viewable content using their collections! I think 3D has a lot of relevance! one of my favorite public participation in planning exercises is Participatory 3D modeling, where everyone gathers around a giant 3D topo map of their area. Yes, I think up to the present, it was hard to see past all the spectacle with something like VR and much remains to be explored before its insights are well understood. Part of the appeal of grassroots mapping for example, is that even solo flights wind up being a very social activity. Whether it be a kite/balloon w/ camera rig or a drone, in most cases it also doubles as a giant banner reading "HEY EVERYBODY ASK ME WHAT I'M DOING!" (whether or not you actually feel like talking to other people...) Moreover, the medium of aerial mapping is about broadening horizons in the most literal sense. Virtual reality on the other hand is somewhat of a paradox. From the perspective of the individual, it can certainly feel like a broadening of horizons, but from a social point of view, the sight of someone blindly flailing around with a headset over their eyes looks ridiculous at best and myopic at worst! I think you hit upon one possible way it could work however in the example you gave earlier. If used within the live planning session itself, VR would only serve to isolate individuals from the interactions around them. BUT if used remotely, it allows people to become active participants when they would normally be isolated. Ultimately then, the question comes down to how much interaction is actually enabled by VR. Or whether it is simply just another medium intended for passive consumption. My own feeling is that the latter description may well apply to everything between "The Lawnmower Man" and the Oculus Rift, but the jury is still out in regards to the pseudo-DIY "Cardboard VR" platform. Even if it I take the cynical view that its just another gimmick on the part of Google to promote Youtube, it would still involve a medium based on user-generated content. In any case, it will be interesting to come back to this thread in three years time and reflect on whether this was all just wishful thinking or if there really is a new medium emerging!